Here’s another puzzle I made in preparation for the recent Logic Masters. It’s a Minesweeper Tapa, a type from the Tapa round on the contest. 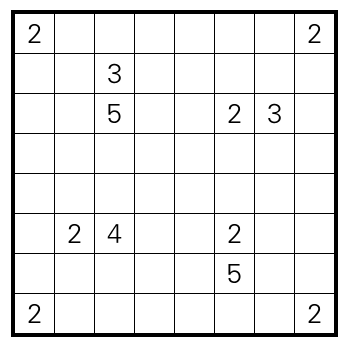 Rules Solve as a regular Tapa, except the clues just specify the total number of shaded cells in the surrounding cells, as in Minesweeper. This entry was posted in Puzzles and tagged medium, minesweeper tapa, tapa, variant on 2018-06-13 by rob. I thought the underlying “regular” Tapa from the JaTaHoKu I published earlier was worthy of a dedicated post. Is there a name around for this variant? While resolving this one will require a few case distinctions, it does have a reasonable break-in, and is quite doable if you choose the right spots. It’s possible that prescribing the number of shaded cells is not necessary, give it a try with three shaded cells per row/column. Rules Solve as a regular Tapa. 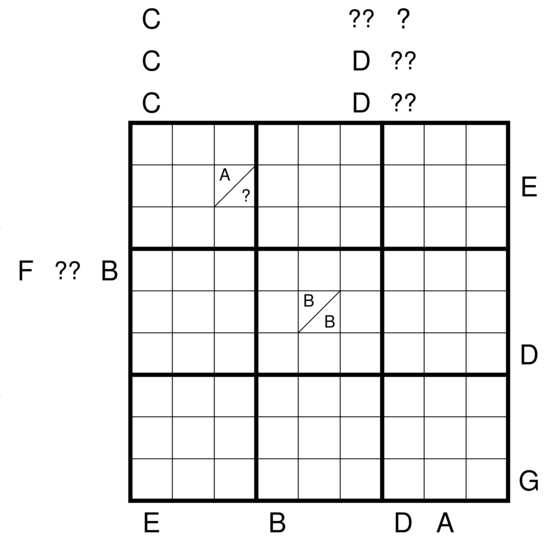 Additionally, there must be exactly four shaded cells in every row and column. This entry was posted in Puzzles and tagged hard, regular tapa, tapa, variant on 2016-06-18 by rob. Last JaTaHoKu for now, a JaTaHoKu with cryptic clues. I made a triagonal one, too, but didn’t get around to rendering that yet. Maybe later. Some digits have been replaced by letters. Equal letters correspond to equal digits, different letters to different digits. This entry was posted in Puzzles and tagged cryptic, hard, hybrid, jatahoku, skyscrapers, sudoku, tapa on 2016-06-17 by rob. Another JaTaHoKu, this time cylindrical. This entry was posted in Puzzles and tagged cylindrical, hard, hybrid, jatahoku, skyscrapers, sudoku, tapa on 2016-06-16 by rob. 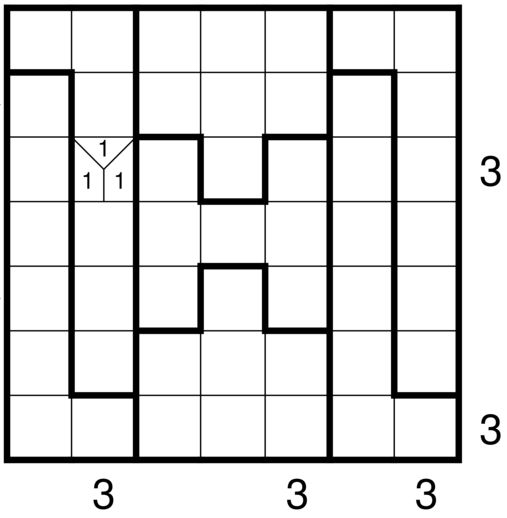 Another JaTaHoKu, this one using the full rule set. It’s probably a bit easier than the first one. 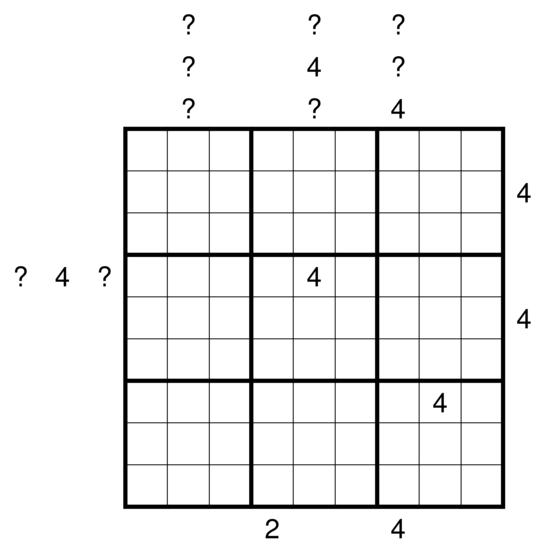 Note that the given 4s in the grid are Tapa clues. This entry was posted in Puzzles and tagged hard, hybrid, jatahoku, skyscrapers, sudoku, tapa on 2016-06-14 by rob. Another JaTaHoKu I just made, to prove to myself that it’s possible to make accessible JaTaHoKus. 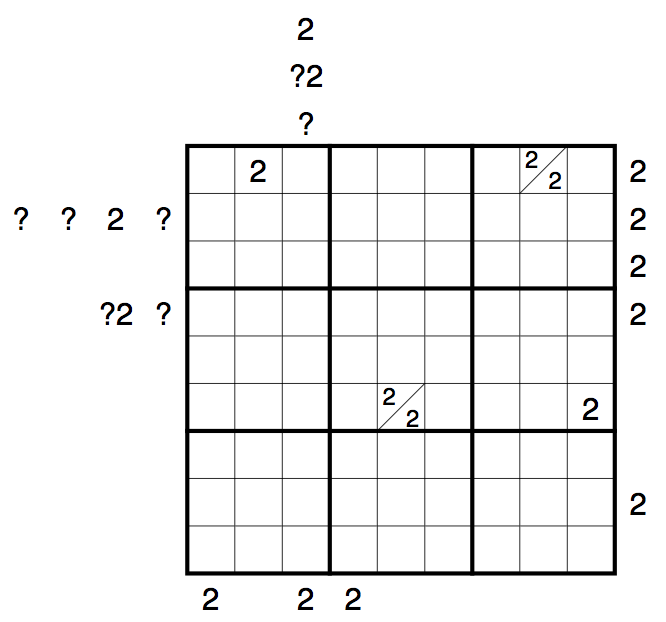 You might want to solve this one before the previous one. This entry was posted in Puzzles and tagged hybrid, japanese sums, jatahoku, medium, skyscrapers, sudoku, tapa on 2016-06-13 by rob. Here’s a first (Ja)TaHoKu, which I made to prepare for the Logic Masters. Mostly an exercise in the interaction between the Tapa rules and the equal number of cells per row/column/region; that part seems to have potential as a Tapa variation. 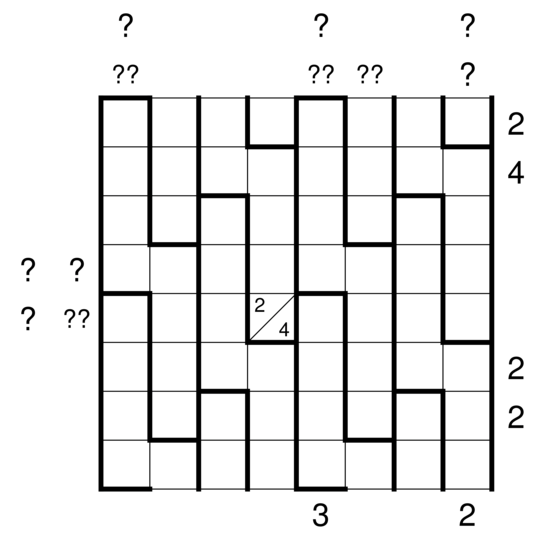 Would you have thought that even without rooms, the one Tapa clue implies that the mirrored cell has to be shaded? Rules Place numbers from 1 to 4 into some cells, such that each row, column and region contains each number exactly once. 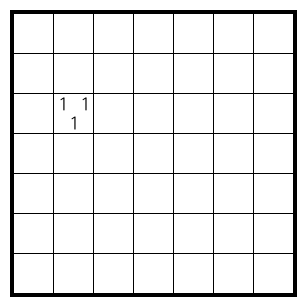 Clues within the grid are Tapa clues; the numbered cells form a valid Tapa solution with respect to these. Clues along the bottom and right edges are skyscraper clues. This entry was posted in Puzzles and tagged hard, hybrid, skyscrapers, sudoku, tapa on 2016-06-13 by rob.